Joanna Ampil (center) is cast as Maria in The Sound of Music. This musical play is being staged at Resorts World Manila. 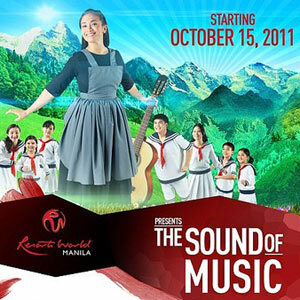 Resorts World Manila brings back The Sound of Music starting October 15, 2011 at the Newport Performing Arts Theater. It features a powerhouse cast of theater veterans and promising newcomers who will bring life to this timeless tale of love. In this musical play, Joanna Ampil will portray Maria Rainer while Audie Gemora is cast as Captain Georg von Trapp. The musically inclined children will be portrayed by Tanya Manalang (as Liesl), Paolo Ocampo (as Friedrich), Rebecca Coates (as Louisa), Anton Posadas (as Kurt), Atasha Muhlach (as Brigitta), Alida Moberg (as Marta) and Alexa Villaroel (as Gretl). Playing as Joanna Ampil’s alternate is Cris Villonco. The Sound of Music opened on Broadway at the Lunt-Fontanne Theatre on November 16, 1959, moved to the Mark Hellinger Theatre on November 6, 1962 and closed on June 15, 1963 after 1,443 performances. The director was Vincent J. Donehue, and the choreographer was Joe Layton. The show even tied for the Tony Award for Best Musical with Fiorello. The Sound Of Music was also nominated for ten Academy Awards and winner of five (including Best Picture and Best Director). It was the number one Box Office Champion from 1966 to 1972, according to Variety’s survey. Today it stands as the most successful movie musical of all time. The motion picture soundtrack, released internationally on the RCA label, locally distributed by Ivory Music & Video, the official licensee of Sony Music, has gone gold and platinum and sold well over 10 million units worldwide. Ivory Music & Video now is offering a new special version of the beloved musical, complete with revised liner notes and brand-new photos. The Sound Of Music includes a very special nod to the music’s impact and influence on younger generations: My Favorite Things, sung by Lea Michelle of the hit TV show Glee. The song’s relevance today in pop culture is a sign of the endearing and lasting achievement of this cinematic and musical touchstone. Also available is the Original Broadway Cast Recording. This CD reissue has noticeably improved sound and adds two bonus tracks: a 16-and-a-half-minute suite of the score put together by original orchestrator Robert Russell Bennett that constitutes a virtual overture and a version of "Do-Re-Mi" by Mitch Miller & the Sing-Along Chorus, with the children of the cast joining in. Call the Resorts World World Manila Tourist/Visitor Hotline at Tel. No. 836-6333, 908-8833 or TicketWorld at Tel. No. 811-9999 for more information about The Sound of Music.